A timpanist just tall enough to rumble his mallets over the kettle drums stares out from beneath his specs as Lars Vogt slides onto the bench for the opening chords of Grieg’s Piano Concerto. 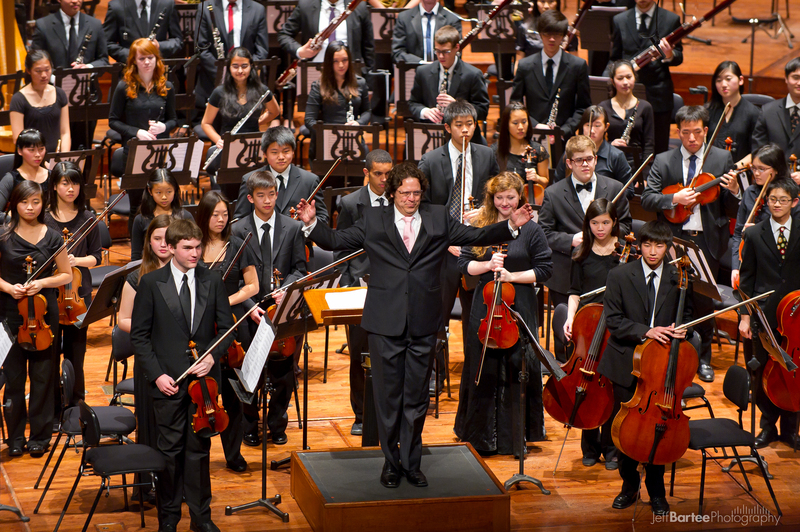 The members of the San Francisco Symphony Youth Orchestra (SFSYO) stamp their feet in congratulation. As rehearsal continues, former Music Director Alasdair Neale, who has dropped into town for a visit, also weighs in from the aisles, coordinating seamlessly with Cabrera to refine balance issues. The orchestra plays through parts of Mahler’s First Symphony, the strings attempting a dreamy pianissimo that even the world’s best orchestras struggle to create. 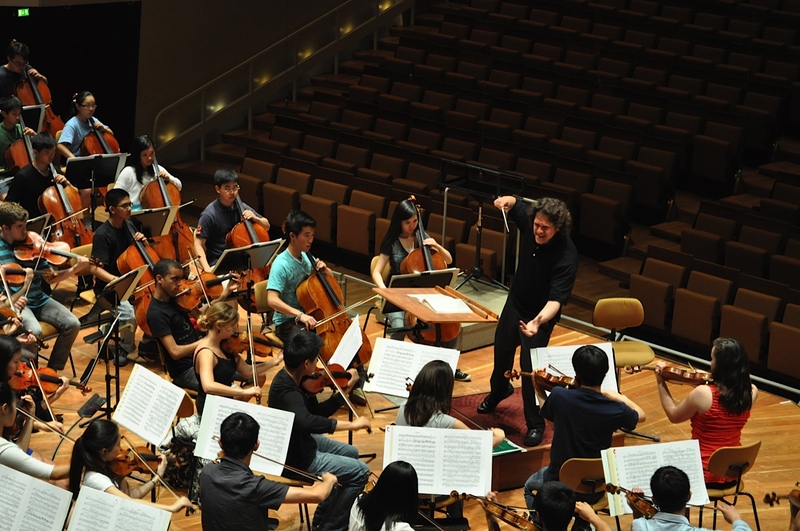 -Few professional orchestras enjoy the same degree of artistic adventure as the SFSYO. The orchestra came to Berlin as part of a European tour (June 20-July 6)—its eighth since being founded in 1981—that traveled through three other German cities, Luxemburg, and ended in Salzburg. As the orchestra’s Director of Education Ronald Gallman pointed out, playing on the same stage as the Berlin Philharmonic is already an enormous accomplishment, not to mention a huge boost for the morale. The ensemble, drawing together Bay area musicians aged 12 to 21, exists on a tuition-free basis (thanks to generous sponsorship which also made this year’s tour possible) and receives weekly coaching with members of the San Francisco Symphony as well as yearly sessions with San Francisco Symphony Music Director Michael Tilson Thomas. Guest artists have included Yo-Yo Ma, Sir Simon Rattle, John Adams, and Midori. At the concert later that evening, the Grieg opened with a precisely built crescendo on the timpani that carried well to the back of the Philharmonie. The close attention in rehearsal to balance made itself clear in the elegant flute and horn solos of the first movement, while Vogt brought a light yet intense touch to the runs underlying the orchestra. Vogt’s emotional togetherness with the ensemble was particularly apparent in the Adagio movement, and the sighing melodies received a lovely rubato in the strings. The final Allegro, featuring Vogt in a spirited evocation of a Norwegian folk dance, was thoroughly polished and on point. Every dynamic shading emerged well-conceived and firmly in its place, yet there was also a mystical quality to the quieter passages, such as when the flute and dusky strings usher in a nocturnal passage on the piano. In Mahler’s First Symphony, Cabrera and the SFSYO admirably captured the leisurely pace the composer indicated in his tempo indication Langsam, schleppend—as opposed to the third movement (Feierlich und gemessen, ohne zu schleppen). The playful “kuckuck” wind motifs were particularly endearing coming from a youth orchestra, contrasting at first ironically with the glassy opening strings and the primordial inquiries underlying the music. The orchestra nailed the Scherzo, with its jaunty waltz riff (in fact an Austrian Ländler), executing phrases of mature heft and temperament. Even after the deluge of Mahler last season for the centenary of his death, it is impossible to resist being captivated by the Frère Jacques canon of the third movement, with its slow, resigned march toward death, interrupted by Jewish folk melodies that mourn as they rejoice. After making its way with rapt attention through this spiritual ambiguity, the orchestra let loose in the turbulent final movement, lending charged passages force without becoming muscular. Mahler not being a composer of the greatest psychological simplicity, the Sitzfleisch and intellectual stamina of these young musicians deserve much praise. Yet it was John Adams’ Shaker Loops that showed the orchestra at its best. The composer’s extensive collaboration with the musicians’ home organization of course strengthens their claim to this music, Adams having inspired the Meet the Composer residency program and established his national reputation with works written for the San Francisco Symphony. Shaker Loops is one of his first major compositions, adapted from a septet to full string orchestra in 1982 and featuring pulsating minimalist textures that, unlike in Reich or Glass, are set to Western harmonies and traditional form. The high energy of the repeated tremoli in the opening Shaking and Trembling immediately brought some west coast wind into the Philharmonie, and the eerie microtonal slides in the following Hymning Slews revealed impressive technical precision. A Final Shaking provided a satisfying close with anxious high-pitched shimmering that yields to ecstatic tonal harmonies. It is not for nothing that the SFSYO won an ASCAP Award for Adventurous Programming and the Award for American Programming on Foreign Tours this year. This entry was posted on Friday, July 6th, 2012 at 9:15 am	and is filed under Berlin Times. You can follow any responses to this entry through the RSS 2.0 feed. Both comments and pings are currently closed.